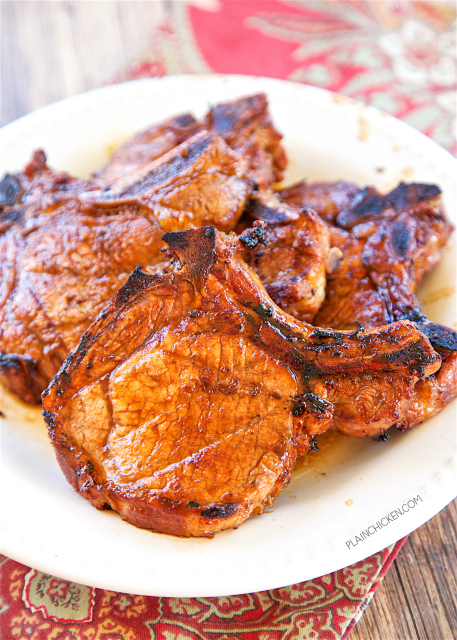 Sriracha Grilled Pork Chops - CRAZY good!! Only 6 ingredients!! Teriyaki sauce, Worcestershire sauce, sriracha, brown sugar, garlic and pork chops. Ready in minutes on the grill. These are THE BEST pork chops I've ever eaten. Tender, juicy, sweet and spicy in one bite. We made these Sriracha Pork Chops last weekend and we are planning on making them again this coming weekend. They were SO good. I'm not usually a fan of pork chops. I think they are tough and dry, but these pork chops were tender and juicy. They had TONS of great flavor! TONS! Even though there is Sriracha in the marinade, these pork chops weren't hot at all. They were so flavorful. Seriously THE BEST pork chops I've eaten. Reserve some of the marinade to baste on the pork chops once they are almost done. YUM! It really gives the pork chops a flavor boost! We used bone-in pork chops, but you could also use boneless pork chops if that is what you have on hand. Enjoy! Whisk together Teriyaki sauce, Worcestershire sauce, Sriracha, brown sugar and garlic. Reserve 1/4 cups of marinade and pour remaining marinade over pork chops. Refrigerate 4 hours up to overnight. 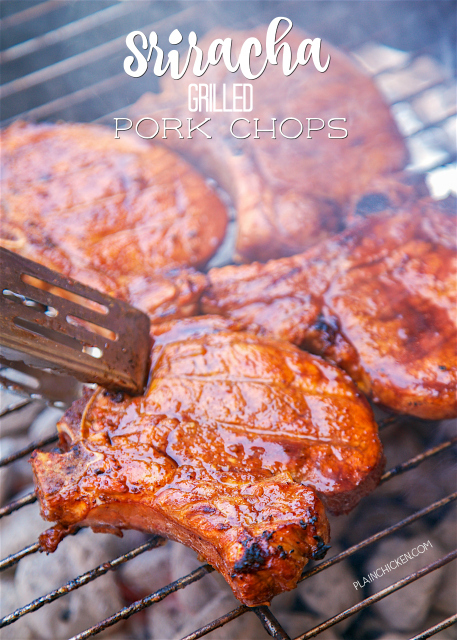 Remove pork chops from marinade and grill until done, 2 to 3 minutes per side. Before removing from grill, brush each side of the pork chops with reserved marinade. 2-3 MINUTES PER SIDE,THAT DOES NOT SOUND LIKE IT WOULD BE DONE??????? Hey, no need to yell at me about it! That is how we cooked them and they were perfect. You can cook them however long you wish. Is the sriracha a powder or liquid? Sriracha is like a spicy ketchup. It is in the asian isle and condiment isle at the store.